The Ticket Vending Machine (TVM) at [redacted] was Our of Order this morning. No other ticket purchase mean at that station. Observation ... Mum dropping off pupil to take the train to school - come onto platform to TVM with said pupil, go to machine, see problem. 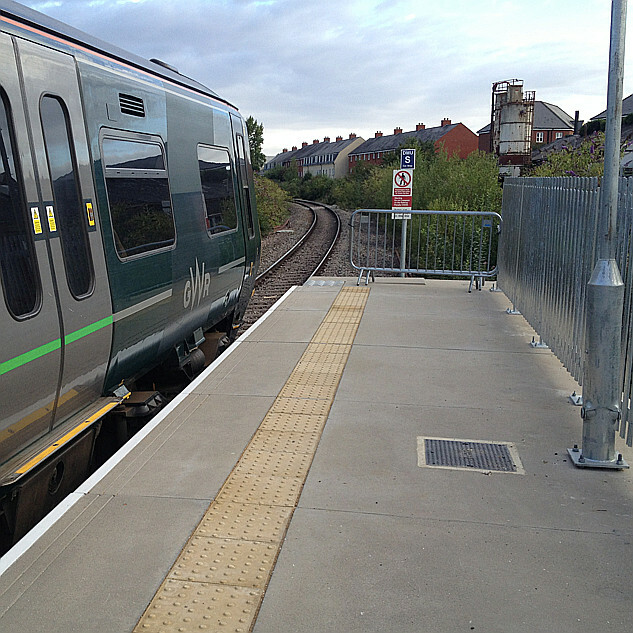 Discussion ensues between pupil and parent, with parent suggesting pupil pays on train. Pupil resists, citing "will be in trouble'. Mum appears unhappy, but pupil gets back in car and both drive off - presumaly to next station. I know that some youths have a bad reputation and that is then reflected in the eyes of some on all youths - but what a pretty pass that those who want to travel legitimately are put off by the worries of using fallback payment systems, and the suspicion generated. I told the train manager the TVM was broken as I got on the train and asked if I could buy from him. "Yes, of course" and I say near his rear cab. By the next station where I was getting off, with lots of others, he had only got a third of the way down the first carriage of a 2 carriage train to sell tickets. I wonder how many people had to suffer the delay as they looked to exit at the next (gated) station. I sympathise. We had a period of weeks on end not so long ago when Taplow station was unmanned & the TVM was broken constantly. GWR pretty much kicked the can down the road until TfL took over. I can understand the child’s reticence. There are many adults who would not be assertive in such situations especially if, for example, the TVM had only recently failed and management were unaware of it. If the guard/RPO had a suspicion that they had a fare dodger on their hands, they would tend to “shoot first and ask questions afterwards,” the shot in this case being a penalty fare. I agree that that could be claimed back but not all potential passengers would think that far ahead and, indeed, may have no means of paying a penalty fare on them at the time. This would especially apply to a scholar on their way to school/ college. I remember 50+ years ago when I was a teenager getting butterflies in the stomach whenever a TTI (As they were known then) appeared even though I always had a valid ticket! The only way to totally overcome this problem is to staff every station but, of course, that will never happen. Help Points may not be a panacea especially when the train is only a minute or so away so there is no time to use it. By the way, why the reacted station name? I struggle to see what potential wrong is being put right by the redaction – the story is that a school or college pupil refuses to get on a train without a valid ticket, which is hardly a locking-up offence!! Might I suggest that we start a "Ticket Vending Machine out of order" thread in "All across the GW territory" section so that we can all report in where we become aware when this occurs? ... may be worth an occasional visit to that section under "station updates"
Hungerford every time it rains. The TVM is outside and when the touch-screen gets wet, it's game over. Most kids have smart phones these days. Mine, who are now young adults, simply photograph the broken machine/error screen and get on the train. All photos are date/time stamped and most are georeferenced. That should help solve most problems. Coincidentally, there was been news from France on a similar topic only yesterday. The rules about boarding a train with no valid ticket have changed, though I can't find any SNCF announcement about it (not unusual, that). There is a new version of The Regulations, in which the section on "regularisation" has been largely rewritten, mostly made simpler, and some facilities removed. The start date for this varies across the network, but is 20th Match for TERs except in Brittany where it was 15th January. There were and are on-board penalty charges (adding to the fare, I think) at several rates, tiered with distance. Which you pay depends on whether you indicate your presence in advance to the inspector (or guard or whatever), or wait to be asked. But for those boarding at a station not selling tickets, it was possible to buy a ticket for that line on board at the normal fare. From now on that will be at the lowest of the on-board rates - and that has got the most press reaction. Interview comments from SNCF have been along the lines that most people without fares are trying to cheat, that most passenger have a pass, that there are now several ways to pay that don't rely on the station being staffed or machined, etc. One minor point I've not seen commented on is that they will also no longer excess fares at all except for change of class - there was a (rather complex) provision for change of route. I hear comments that "surely most young travellers have smart phones" and I agree. But most of them are also taught by their parents to follow the rules. So many (most?) are less than happy where the rules are written at the stations to break the normal routine / mainline rule. Forum members here are articulate, typically knowledgable, and typically of a social and age profile that train managers and gateline staff will listen to them. At the other extreme, some younger travellers are nervous / often sheltered and cared through joining the train by a "helicopter" parent, not [yet?] good communicators, and have a social / age look that could lead to quick stereotyping as potential fare evaders. I can understand older law abiding children's resistance to joining trains without a ticket. GWR have a very real problem with fare evasion, especially where there's a cluster of stations a short distance apart without gate lines, intermittent staffing only at ticket offices and trains that are no longer through corridors. Sanctions against younger people who buck the rules and get caught are not (I don't believe) as stringent as those against people a few years older, and there's something of an increased social ranking in some groups where younger people 'get away with it'. I'm not really suggesting any magic wand here. Starting back at the top of the thread, having TVMs working all the time would help. Ironically, having TVMs work only 50% of the time might also work as buying tickets on the train / at the gateline would become routine for the nervous young travellers. Permit to travel machines are not such a bad idea either - would need, though, to take cash and card these days with all the cash issues that make them labour intensive to run and vandalism prone, added to the electronic complexity. As we move from "you MAY use a TVM to buy your ticket" through "you SHOULD use a TVM to buy your ticket" and "you NEED to use a TVM to buy your ticket" to "you are breaking the rules if you fail to buy a ticket if a TVM is available", we also need to ensure that the TVM is available at all times, provides everything that's needed, and is easy for every user to understand. We are, sadly, short on those things that should be ensured. Yes, this is the point. A lot of TVMs don't work when the weather gets even slightly damp. This won't show up on any system reporting broken TVMs, so will be pretty impossible for a passenger to prove to on board staff. I spoke to GWR about poor installation design and consequent unreliability of TVMs. I was told that they had a service level agreement in place with a supplier so that any defects would be fixed in 24 hours. Which is nice, but completely irrelevant, as it has been known to be either wet or sunny continuously for weeks on end. * A working TVM - except the area of the touch screen required for entering the letter "e". * A TVM that printed the outward portion of the ticket but then stopped with a pink screen. Thanks Grahame - never seen that before! I use Journey Check on my mobile where I do not seem to be able to obtain this part of the service, whereas I can get all for the Coffee Shop! I think the section may come and go (if there's nothing to report).